One of Europe's greatest playwrights, Caryl Churchill has been internationally celebrated for four decades. She has exploded the narrow definitions of political theatre to write consistently hard-edged and innovative work. Always unpredictable in her stage experiments, her plays have stretched the relationships between form and content, actor and spectator to their limits. 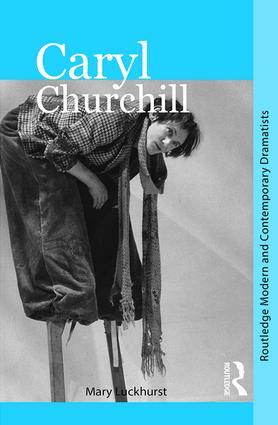 This new critical introduction to Churchill examines her political agendas, her collaborations with other practitioners, and looks at specific production histories of her plays. Churchill's work continues to have profound resonances with her audiences and this book explores her preoccupation with representing such phenomena as capitalism, genocide, environmental issues, identity, psychiatry and mental illness, parenting, violence and terrorism. It includes new interviews with actors and directors of her work, and gathers together source material from her wide-ranging career. "This is the book about Caryl Churchill we've been waiting for. Mary Luckhurst does several things brilliantly. She relates Churchill's plays to the their cultural and political context, shows how their formal experimentation is dictated by ideas and analyzes their performance-history through the words of practitioners. I learned an amazing amount." "This critical examination of some of Churchill's most significant works manages to distinguish itself from the dozens of other works on her. Its particular value lies in Luckhurst's interweaving theatre practitioners' voices (those of actors and directors) into the theoretical and historiographic discourse." Professor Mary Luckhurst is Chair of Modern Drama at the University of York and co-founder of York's new Department of Theatre, Film and Television. She has published extensively on modern drama and written the first cultural history of new play development: Dramaturgy: A Revolution in Theatre for Cambridge University Press. Her directing career includes Churchill's Far Away and Mad Forest for the York Theatre Royal. Routledge Modern and Contemporary Dramatists is a new series of innovative and exciting critical introductions to the work of internationally pioneering playwrights. The series includes well-established playwrights and offers primary materials on contemporary dramatists who are under-represented in secondary criticism. Each volume provides detailed cultural, historical and political material, examines selected plays in production, and theorises the playwright’s artistic agenda and working methods, as well as their contribution to the development of playwriting and theatre.